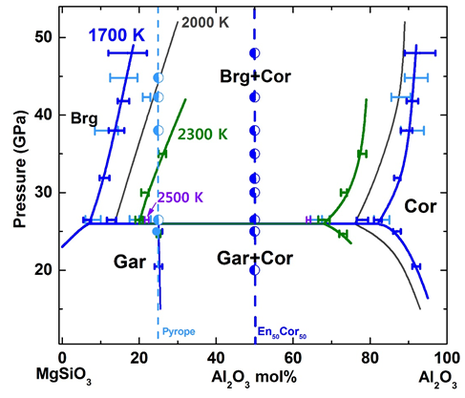 Phase relations in the system MgSiO3–Al2O3 were investigated at pressures of 27–50 GPa and temperatures of 1700, 2000 and 2300 K using sintered diamond and tungsten carbide anvils in a multi-anvil apparatus. The bulk compositions along the MgSiO3–Al2O3 binary system crystallize a phase assemblage of pyrope and corundum at pressures below 27 GPa, while they crystallize an assemblage of bridgmanite and corundum at pressures above 27 GPa regardless of temperatures. It is found that temperature significantly increases the solubility of Al2O3 in bridgmanite and that of MgSiO3 in corundum. The solubility of Al2O3 in bridgmanite increases from 6.5 mol% at 1700 K to 21.8 mol% at 2500 K under a constant pressure of 27 GPa. Bridgmanite becomes more aluminous with increasing pressures: Al2O3 increases from 6.5 mol% at 27 GPa to 17.5 mol% at 48.5 GPa under a temperature of 1700 K, 12.5 mol% at 27 GPa to 21.9 mol% at 42.3 GPa under a temperature of 2000 K, and 19.2 mol% at 27 GPa to 27.3 mol% at 35 GPa under a temperature of 2300 K.
Phase relations in the MgSiO3–Al2O3 system at 24–50 GPa and 1700, 2000 and 2300 K.